[PDF] A Lethal Obsession: Anti-Semitism from Antiquity to the Global Jihad | Free eBooks Download - EBOOKEE! 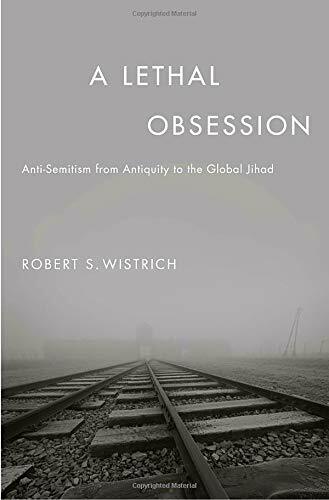 Description: In this unprecedented work two decades in the making, leading historian Robert S. Wistrich examines the long and ugly history of anti-Semitism, from the first recorded pogrom in 38 BCE to its shocking and widespread resurgence in the present day. As no other book has done before it, A Lethal Obsession reveals the causes behind this shameful and persistent form of hatred and offers a sobering look at how it may shake and reshape the world in years to come. Here are the fascinating and long-forgotten roots of the â€œJewish differenceâ€â€“the violence that greeted the Jewish Diaspora in first-century Alexandria. Wistrich suggests that the idea of a formless God who passed down a universal moral law to a chosen few deeply disconcerted the pagan world. The early leaders of Christianity increased their strength by painting these â€œsuperiorâ€ Jews as a cosmic and satanic evil, and by the time of the Crusades, murdering a â€œChrist killerâ€ had become an act of conscience. Moving seamlessly through centuries of war and dissidence, A Lethal Obsession powerfully portrays the creation of the Protocols of the Elders of Zion, the fateful anti-Semitic tract commissioned by Russiaâ€™s tsarist secret police at the end of the nineteenth centuryâ€“and the prediction by Theodor Herzl, Austrian founder of political Zionism, of eventual disaster for the Jews in Europe. The twentieth century fulfilled this dark prophecy, with the horrifying ascent of Hitlerâ€™s Third Reich. Yet, as Wistrich disturbingly suggests, the end of World War II failed to neutralize the â€œJudeophobic virusâ€: Pogroms and prejudice continued in Soviet-controlled territories and in the Arab-Muslim world that would fan flames for new decades of distrust, malice, and violence. Here, in pointed and devastating detail, is our own world, one in which jihadi terrorists and the radical left blame Israel for all global ills. In his concluding chapters, Wistrich warns of a possible nuclear â€œFinal Solutionâ€ at the hands of Iran, a land in which a formerly prosperous Jewish community has declined in both fortunes and freedoms. Dazzling in scope and erudition, A Lethal Obsession is a riveting masterwork of investigative nonfiction, the definitive work on this unsettling yet essential subject. It is destined to become an indispensable source for any student of world affairs. No comments for "[PDF] A Lethal Obsession: Anti-Semitism from Antiquity to the Global Jihad".